April Kennedy...My Life + My Style: DAVE'S BIRTHDAY REVIEW! 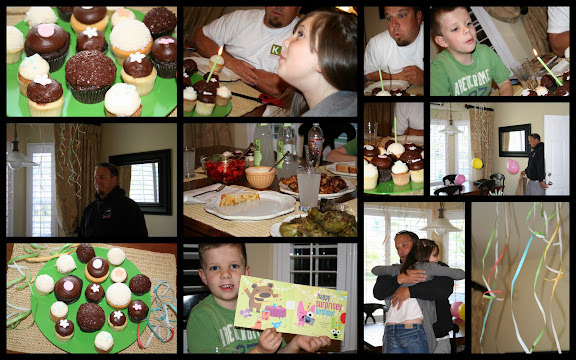 The kids were really excited to throw daddy a little surprise birthday party complete with balloons and streamers. I have never seen them work so hard and fast to get something accomplished in such a short period of time. But they did it. And daddy was surprised! On the menu for dinner......grilled chicken, grilled artichokes and grilled garlic bread. What can I say, the man loves grilling! I did surprise him with Cioppino (seafood stew) as a soup appetizer while he was grilling. And for dessert, we feasted on Kara's Cupcakes. Blake found the perfect card for his "surprise" party. It is one of those audio cards. I need to record it and post it later if I can. It was perfect and quite hilarious once I listened to the whole thing. It goes something like....."happy birthday totally in your face....were you surprised....i think so....i see a little wet spot.....do you need to go change your pants......that happens when you get older.....surprise...hahaha.....we got you.....in your face!" Here is the collage. Have I told you lately that I love Picasa 3 (it came on my laptop) and I have just recently discovered it? It makes these fantastic picture collages with a click of a button from the picture folder! Yeah for easy, fast and so cute. Hope your day was special, daddy! We love you so much. Like "totally in your face" so much! The collage is great! Dave's birthday surprise looks so much fun and those cupcakes look delcious! I love the collage & the grilled food looks delicious! As an adult, sometimes it seems difficult to make birthdays feel special, but it looks like you did a great job! Hilarious card! What a lucky guy to have you 3! Happy Birthday Dave! I was hoping you had a picture of the card. LOL As soon as I read what it said, I knew it'd be those characters. Love them...they're funny. The cupcakes look tasty....I'm getting hungry. Thanks.